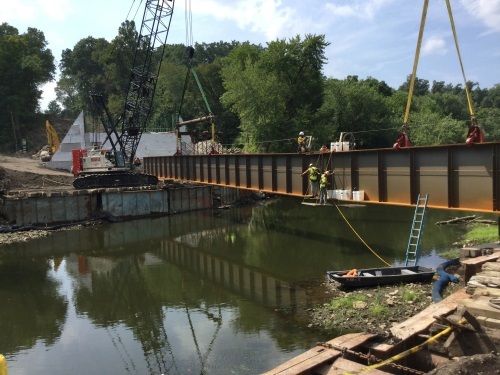 The Pennsylvania Department of Transportation noted in a Nov. 30 update that 511 of 558 “poor-condition” bridges statewide have now been replaced and opened to traffic via the state’s public-private partnership or P3 Rapid Bridge Replacement project. She added that there are currently 41 bridges under construction via this project, with construction anticipated to finish in 2019. Due to this project and other investments, PennDOT added that – since January 2015 – the status of 819 state-maintained bridges has been raised to “good condition,” another 95 are now in “fair condition,” while the number in poor condition has decreased by 1,044 to just less than 3,000 – down from a high of more than 6,000 in 2008. PennDOT noted that the $899 million Rapid Bridge Replacement P3 project began in 2013, with Plenary Walsh Keystone Partners financing, designing, constructing, and maintaining the bridges via the program for a 25-year period beyond completion, while PennDOT will be responsible for routine maintenance such as snow plowing, debris removal, and incident response.